If you’re planning to head out of town on a holiday over the Easter weekend and would like to stay in Byron Bay, you better book now! Easter in Byron Bay is always a busy and fun long weekend as the Bluesfest takes place every year over this holiday. The popular festival, which started in 1990, hosts more than 200 performances over five days. However, even if Bluesfest isn’t the reason you’re coming to Byron Bay for Easter, there’s still plenty of holiday fun to be had for the whole family. Holiday workshops at The Farm – Both Saturday and Sunday of the Easter holiday The Farm will offer a fun workshop for kids from 11 am to 2 pm. Kids will take a tour of The Farm, which will include learning about and seeing the pigs, bees, chickens, flower crops, herb garden, orchard, and vegetable crops. They will be educated about various farming terms such as pollination, healthy soil, composting, and animal paddock rotation. There will even be an opportunity to collect eggs and see how the chicken caravan operates. The kids also will pick and taste vegetables, edible flowers, and herbs. There will, of course, be an Easter egg hunt in the orchard and will be followed by a craft using the eggs. Note: If you’re coming out to The Farm, use the opportunity to try out the restaurant. Created by the owners of Three Blue Ducks in Sydney, this restaurant’s menu changes with the seasons and the ingredients for the dishes the owners/chefs source from the surrounding farm or locally. Breakfast and lunch is available seven days a week from 7 am to 3 pm, and dinner is served from 5 to 9 pm Friday through Sunday. “Buy Local” Easter Egg Hunt – Nearby Brunswick Heads offers kids an Easter egg hunt that makes them travel through various local shops around town looking for eggs. Kids (with their parents along as well, of course) should start the fun hunt at the Brunswick Head Visitor Centre at 7 Park St. where they will be given the Easter egg guide. Shops participating in the hunt display posters in the windows, and kids on the hunt are allowed to try and find the hidden eggs in the shops. Kids mark theirs answers in the guide and then turn in completed guides at the Visitor Centre. This will enter them in a drawing to win all the eggs. Byron Bay Beachside Market – Held from 8 am to 4 pm, the Byron Bay Beachside Market features more than 200 stalls that offer up art, home wares, clothing, crafts, and much more all set up just off Main Beach, Byron Bay’s most famous beach. The items found in the stalls are made by local artists and designers, and local practitioners perform the health and well-being services. Live music also will be helping create the atmosphere for the market. Situated over a half kilometre just to the right of the Surf Club, the market only takes place three times a year so use your holiday to Byron Bay over the Easter weekend to check out all the excellent items available. 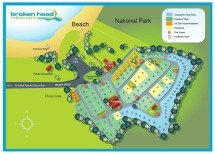 Book your Easter in Byron Bay this year at Broken Head Holiday Park where you have the options of staying in various accommodation from campsites to beach shacks. Here you can relax in our peaceful surroundings while still being close to all the Easter activities you’ll want to do on your holiday. If you just want to keep it local, here at Broken Head we will have a colouring competition running and have an arts and craft session too. With our top-notch facilities, you can cook Easter dinner on our BBQ and then pack everything up and head down to our beach to enjoy a memorable seaside picnic. Don’t delay, plan to come here for a fun Easter holiday! If you’re planning to stay after Easter we still have sites available from the 1st April and some cabins from 30th March for the school holidays. The minimum night stay drops to 4 nights from the 15th March.